Congratulations to University of Illinois College of Law Trial Team members Jacque Donahue ’19, Blake Gibney ’19, Kheana Pollard ’19 and Samantha Swartz ’19, who participated at the National Trial Advocacy Competition (“NTAC”) in Pontiac, Michigan October 20 – 22, 2017. Competing in a field of 12 law schools from across the nation, our students made us proud with unwavering advocacy throughout the event. The team advanced all the way to the semi-final round, finishing as a top four team and earning the tournament’s second highest team cumulative score over the three preliminary rounds. Additionally, Kheana Pollard was named the competition's "Best Overall Advocate." Stephanie Hall ’13, an attorney at Meyer Capel in Champaign, served as the dedicated coach for the NTAC team. Professor Catherine Stahl (Director of the College’s Trial Advocacy Program), J. Andrew Langan (Partner, Kirkland & Ellis Chicago), Professor Eric Johnson (Associate Dean for Academic Affairs) and Dominique Ritvo ’18 provided additional assistance. Professor Stahl is proud of her students and their earned competition successes. "The awards and bragging rights are well-deserved honors for the team’s hard work and dedication. 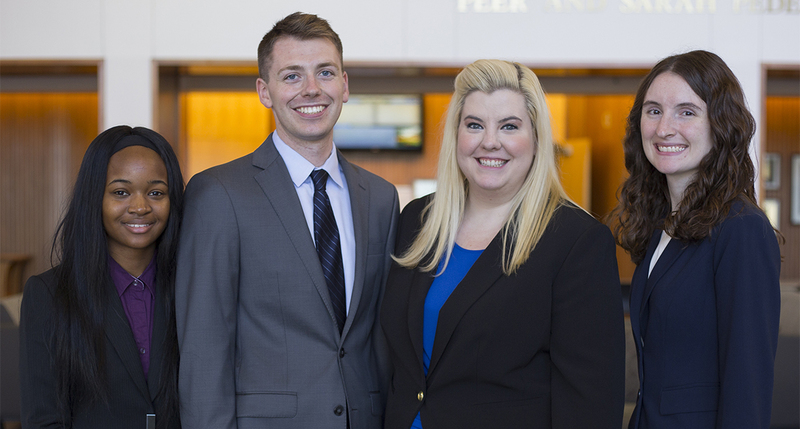 Moreover, the trial team experience leaves the students with a lasting benefit of confidence in their courtroom abilities as they embark on their new professional roles after graduation," stated Professor Stahl. Learn more about the Trial Advocacy Program on our website, or reach out directly to Professor Catherine Stahl for additional information.